Philadelphia, March 1, 2013— Parsons The New School for Design presents ALIGN, a group exhibition that represents a collective conversation among the current generation of emerging artists. The exhibition features works by students in the MFA Photography program at Parsons. 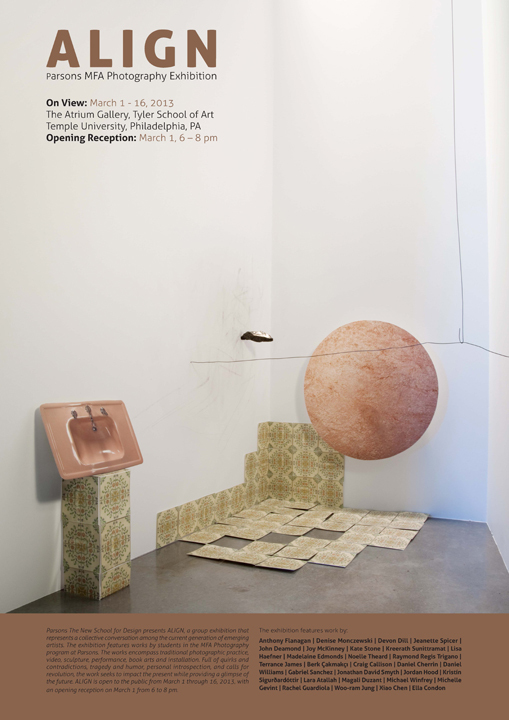 The works encompass traditional photographic practice, video, sculpture, performance, book arts and installation. Full of quirks and contradictions, tragedy and humor, personal introspection, and calls for revolution, the work seeks to impact the present while providing a glimpse of the future. ALIGN is open to the public from March 1 through 16, 2013, with an opening reception on March 1 from 6 to 8 pm. The Parsons MFA Photography program functions as a 21st-century studio and think tank. Students are encouraged to develop their individual vision in a collaborative, interdisciplinary environment and to explore related technologies, focusing on the relationship between concept and production. A rigorous critique process and regular meetings with faculty, professional artists, and visiting critics help students develop individual points of view and situate themselves and their work within larger historical, theoretical, and contemporary visual contexts.